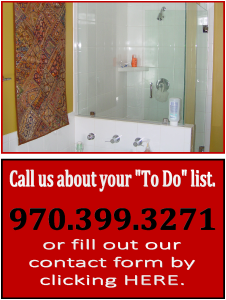 Bathroom Remodeling - Jones Construction Services, Inc.
Bathroom so small you have to leave the room to change your mind? Is your current bathroom uninviting, too small, or just impractical for the way you live? Do you have fuzzy things growing in the corners of the shower? Getting older and need your bathroom to be more accessible? Then you need Jones Construction Services to remove your bathroom woes by renovating your current bath to a more inviting and practical space. Our in-house designs are able to take your current room and transform it into that bathroom you always wanted and needed by using products that are long lasting and durable. When you are getting older and you need better access to your bathroom, but you don't want to leave your current home to get it, Jones Construction Services can design an Aging-in-Place bathroom that will serve you well. We know what it takes to make your bathroom ADA accessible and safe. Give us a Call Today to see how Jones Construction Services can turn that problem into a joy.